"The Doctor, Ace and Mel are caught in a forever night. After crossing the threshold, a strange world awaits them. But when his companions become victims of the desperate and powerful Arkallax, the Doctor will have to do battle in a psychic environment where he must make a choice. Save his companions… or himself." When I’m writing these reviews, I try to avoid other people’s. You don’t want to have your ‘voice’ accidentally imitate someone else’s viewpoint and articulation, and you certainly don’t want to start framing your arguments with somebody else’s words, albeit accidentally. It’s been hard, though, to avoid everyone’s praise for this play and while it did not land for me in the same way Red Planets did, last month, it’s easy to see why it’s getting plenty of nods in the right direction. The story starts with a battle in space, but before too long, things have been dragged down to Earth with a real bump: an abandoned estate, zombie-esque humans shuffling and moaning that they’re hungry, Northern accents aplenty and a lift that does not go where it should be going, all get thrown into the mix alongside an alien that takes over both the body and vernacular of a local resident, a young couple trapped as the monsters make their way across the land, and, of course, the Doctor, Ace and Mel. Sylvester McCoy especially sounds like he’s enjoying this one, though the extras reveal that Bonnie Langford and Sophie Aldred are in what is termed a “playful” mood during the recording session, which is a lot of fun to listen to. The opening couple of episodes of the play are very strong, with a nice sense of menace and that wonderfully Doctor Who thing of merging the mundane with the fantastical: a block of flats being attacked by an alien menace. Actually, that sounds a lot like Attack the Block, doesn’t it? Perhaps Jodie Whittaker has been having a word. … still reading? Okay, spoilers begin. In the end, the big bad is another psychic foe (or rather, a foe with psychic abilities) and though Morris has a neat and novel spin on it, it does rather boil down to the Doctor ensnaring a villain in their own trap and lots of shouting about possession and minds and battling with mental powers. It just feels beyond over-familiar from Big Finish now to be falling back on this once again and it rather flattens the second half of the play. I’m also not entirely comfortable with the brain tumour subplot. I understand that Morris is trying to make a point here about how diseases in the past once thought incurable can now be corrected with little fuss, but it comes off as a little trite to have one of our lead supporting characters cured of his with a nod and a lot of laughing about how silly it is to be worrying about them. I wonder if something like terminal cancer would be dealt with which such flippancy? It just felt in rather poor taste for me, though I appreciate the point that was being made. 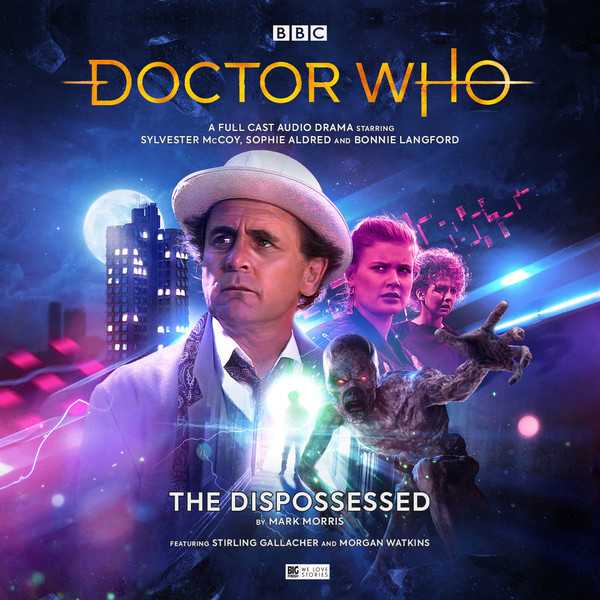 The Dispossessed ends with Mel going rogue and leading the Doctor, Ace and the TARDIS to the lair of none other than Dogbolter himself, which could be a lot of fun. It’s not the return of Frobisher comic book fans, but it’s close and I’ll take it. The only downside is that this means Guy Adams will be absent from script editing duties. On the strength of his efforts this year, that’s a crying shame and I hope it is not too long before he is persuaded to return to the role. This does not diminish the good though so let us be grateful for another solid script in this run of Doctor / Mel / Ace adventures. Here's hoping more comes our way soon. + The Dispossessed is OUT NOW, priced £14.99 (CD) / £12.99 (Download).